The Chibok Girls: The Boko Haram Kidnappings and Islamist Militancy in Nigeria by Helon Habila. Columbia Global Reports, 2016. Paperback. 128 pages. The Chibok Girls is a short book, but it is packed to the brim with important information and heartbreaking realities. Most of you will likely remember when the news broke in April of 2014 that 276 girls from Chibok Secondary School in northern Nigeria were kidnapped by the terrorist group Boko Haram. The author, Helon Habila, tells the story of this tragic event, while also explaining the political and social issues that both contribued to and occurred as a result. Habila traveled to Chibok, which has essentially been on a lockdown since the kidnappings, where he met with family members, encountered difficult roadblocks, interviewed the few girls t hat managed to escape. This is a really important book. Habila provides an incredibly in-depth overview of the Boko Haram: how it began, how it has risen in power, and how it has acted out and affected the country. He also provides information on the political atmosphere and struggles that have taken place and are currently occurring in Nigeria, which I found extremely beenficial in understanding the entire event. The most heartbreaking aspect of this small book is, of course, the discussions surrounding the kidnapping of the girls and how their families have dealt with it. He describes how many parents became physically ill, began to lose their minds, and even died as a result of the stress and fear that has been instilled in them. Habila talks about the ways in which the government has denied them assistance - even, at times, refusing to take the kidnapping seriously and help the families. What's important to realize is that this book is not full of information that isn't possible to find elsewhere, since the girls he interviewed have already made statements and the political and historical information isn't exactly secret. However, this didn't bother me at all, as I found the way in which Habila combined all of the information into one book was very deftly done. It is is rich in detail and honesty, and is filled with the sad realities of the lives of those who lives near such dangerous terrorist groups. Overall, I have decided to give The Chibok Girls four stars. 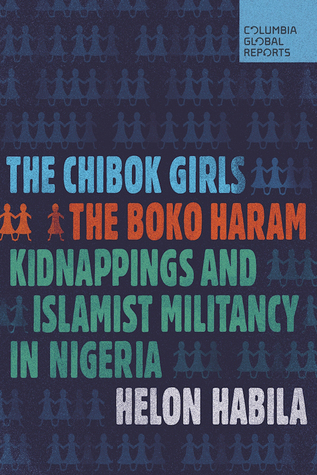 I am immensely thankful that Habila took both the time and immense risk to travel to Chibok and write a comprehensive book that will help people better understand this event and the terrorist organization that is responsible. This is a must-read for just about anyone. Get more reviews and bookish fun in your inbox by subscribing to Forever Lost in Literature!